Unstable and rapidly eroding coastlines can cause risk to local infrastructure, and as such, it is important to gain a deeper insight and knowledge into the exact movements and erosion of a coastline. Capturing high-resolution 3D data of unstable slopes in an important step in understanding coastal erosion. The improved insight gained from such datasets can be used to inform the design of suitable preventative and remedial measures. Due to the typically inaccessible nature of the coastal terrain, it can be difficult to obtain these detailed 3D datasets. The challenging task of coastal monitoring is greater simplified with the use of high-resolution, long range laser scanning monitoring technology, developed by 3D Laser Mapping. Data sets can be collected from different sensors, over different time periods and combined for use on a large scale monitoring project. Durham University purchased SiteMonitor4D to better understand the process of coastal erosion as part of a KTP (Knowledge Transfer Partnership) project, funded by Innovate UK. The project focussed on monitoring the rock faces on the North Yorkshire coast in the UK, near the historic town of Whitby and uses both airborne laser scanning and terrestrial laser scanning to collect the data. For the airborne surveys, the lightweight and portable Mobile Mapping system ‘StreetMapperIV’ was chosen, and was mounted onto a helicopter to perform the job. The benefit of this method of survey is that it allows the research team to monitor large scale changes, over a large area, less frequently. Two repeat surveys were carried out over a period of ten months. Using an automated classification algorithm that compared the laser data acquired from the first and second surveys, it was possible to create a 3D map, highlighting areas of change on the cliffs. In addition to the airborne surveys, which gave a long-term view of the rock face, terrestrial laser scanning is used with automated analytical software gave a continuous and frequent capture of data. SiteMonitor4D was configured to scan the cliff face 24 hours a day at 30 minute intervals. 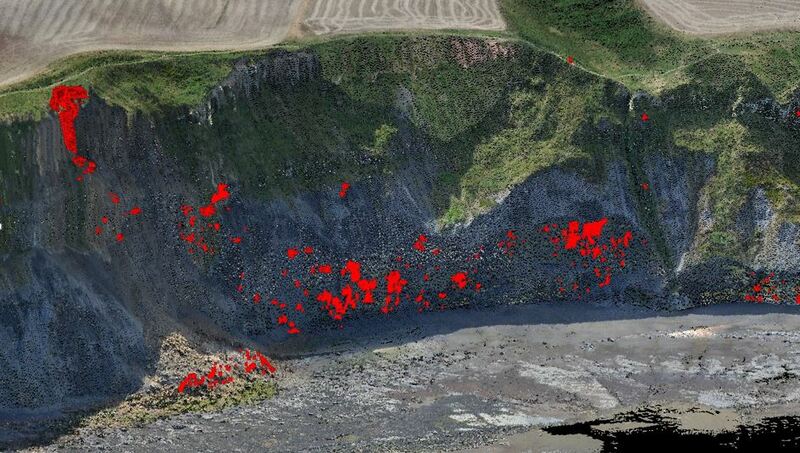 Every scan of the cliff face is taken at approximately 10 cm intervals, generating over 2 million points per scan. The analysis of such a large volume of information however presents significant challenges. To overcome this, the system streams data live from Whitby to Durham, where the analysis is undertaken. Airborne surveys using StreetMapperIV, and terrestrial laser scanning can be carried out independently and used to measure the rates of coastal instability. However, it should be noted that the displacement information gathered from both methods combined, allows for a much greater insight into the process of coastal erosion and rock fall. 3D Laser Mapping is a trusted supplier of technology for monitoring and mobile mapping. Committed to supplying solutions for informed decision making, we work with a network of specialist partners and customers around the world to deliver solutions you can count on. Established in 1999, 3D Laser Mapping is a research led, privately owned company based in Nottingham, UK. We also operate out of local offices in Perth, Australia, Centurion, South Africa and Denver, USA.